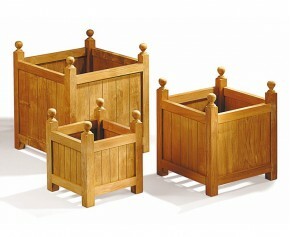 Add a touch of personality to your garden with these beautifully crafted wooden garden planters. Manufactured in genuine Grade-A teak, these timeless patio planters offer a great way to to add a little greenery to your outdoor space and look just as attractive as the plants growing in them. Choose from our range of teak planters here. These teak garden versailles planters are manufactured in smooth sanded, Grade A teak and feature a strong slatted base for drainage. Add a touch of personality to your garden with these beautifully hand crafted extra large Versailles planters. Manufactured from plantation grown A-grade teak for lifelong durability and aesthetic appeal, these garden wooden planters have been finely sanded for a 'smooth to touch' finish and feature a convenient strong flat slatted base for drainage. These stylish square garden planters offer a great way to incorporate a little greenery in your outdoor area, and look equally as attractive as the plants growing in them. Manufactured entirely in plantation grown A-grade teak Tectona grandis for lifelong durability, these square garden planters have been fine sanded to a smooth finish for your convenience. This great value wooden garden planter is manufactured entirely in sustainably sourced, grade-A teak for long life and aesthetic appeal. 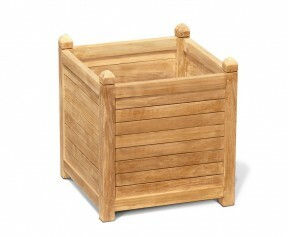 This square teak versailles planters features a strong flat slatted base for drainage. 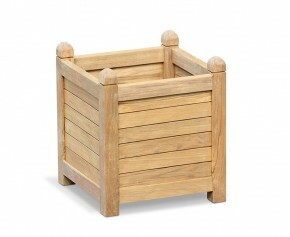 Add a touch of personality to your outdoor setting with this wooden garden planter - large versailles planter. 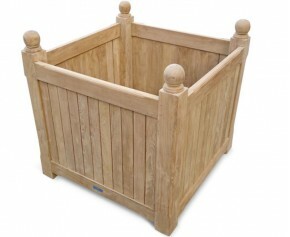 Beautifully manufactured from plantation grown A-grade teak for long life and aesthetic appeal, this wooden garden planter has been finely sanded for a 'smooth to touch' finish and features a convenient strong flat slatted base for drainage. Incorporate a touch of personality to your outdoor space with this teak grand versailles planter. Beautifully crafted from sustainable grown A-grade teak for long life and aesthetic appeal, this extra large garden planter has been finely sanded for a 'smooth to touch' finish and features a convenient strong flat slatted base for drainage. This Zen large garden planter exudes contemporary style and is an ideal gift for gardeners to get creative using trees, plants and flowers to make beautiful features for their garden or doorstep. This Zen extra large garden planter exudes contemporary style and is an ideal gift for gardeners to get creative using trees, plants and flowers to make beautiful features for their garden or doorstep.